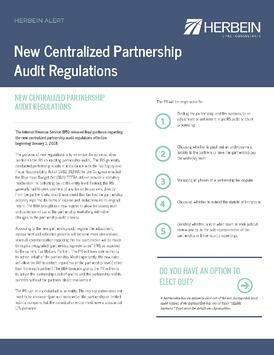 The Internal Revenue Service (IRS) released final guidance regarding the new centralized partnership audit regulations effective beginning January 1, 2018. The purpose of new regulations is to minimize the administrative burden on the IRS conducting partnership audits. The IRS generally conducted partnership audits in accordance with the Tax Equity and Fiscal Responsibility Act of 1982 (TEFRA) before Congress enacted the Bipartisan Budget Act (BBA). TEFRA did not provide a statutory mechanism for collecting tax at the entity level. Instead, the IRS generally had to seek payment of any tax underpayment directly from the partners who would have owed that tax had the partnership properly reported its items of income and deductions on its original return. The BBA brought in a new regime to allow for assessment and collection of tax at the partnership level along with other changes to the partnership audit process. According to the new partnership audit regime, the adjustment, assessment and collection process will become more streamlined, since all communication regarding the tax examination will be made through a designated “partnership representative” (PR), as opposed to the current Tax Matters Partner. The PR will have sole authority to act on behalf of the partnership. Most importantly, the new rules will allow the IRS to collect unpaid tax at the partnership level (rather than from each partner). The BBA basically grants the PR authority to act on the partnership’s behalf and to bind the partnership and its partners without the partners’ direct involvement. The PR can be an individual or an entity. The representative does not need to be an owner (partner/member) of the partnership or limited liability company, but the individual or entity must have a substantial U.S. presence. Herbein alert prepared by Maria D. Stromple. To read more about Maria click here, or email us at info@herbein.com.